If there was an award for the most wrongly compared pair of aircraft, it had to go to the pair we are going to talk about in this article. One of the aircraft was designed to be a tank killer, use it advanced weaponry including a deadly 30mm Gatling gun to rip open tanks whereas the other was more general purpose, capable of taking out a wide variety of targets with ease. Both of these aircraft would end up being famous with their armed forces due to the timely support they gave during conflicts, thus fulfilling their role of Close Air Support. Both of these would be literally flying tanks, capable of surviving a lot of damage and bringing their pilot back. Infact one of them, the tank killer was named Thunderbolt II to honor a world war 2 era fighter with massive firepower and a lot of armor also famous for bringing its pilot back after being shot up pretty badly, it was named after the P-47 Thunderbolt. Lets compare these close air support aircraft to understand their differences. In my previous article on countdown to tank battles of Iraq, I had stated that American and western tank industries, even with all their technological might were no match for the shear numbers the Soviet union was producing. Even though western tanks could kill several Soviet tanks before being knocked out themselves, but standing up against nearly 100,000 tanks and other armored vehicles in service with the Warsaw pact countries was not going to be an easy task. The T-55 would form the backbone of Soviet tank formations, its newer variant the T-62 would supplement it later on. The western forces led by the Americans needed a tank killer. This tank killer had to kill tanks faster than the Soviets could build em during the conflict. This aircraft had to stop waves of Soviet armor rolling down the European plains to protect the western allies. It also had to counter growing air defense capabilities being fielded by the Soviets. With this in mind, they started the A-X programme was a Close Air Support aircraft was started in March 1967 and RFIs were sent to several defense contractors. Increase in Soviet attack capabilities meant that the requirements were changed to suite the threat posed by the Soviet armored formations. Following are the requirements which were put up by the USAF. 30mm gun with high rate of fire for killing tanks and armored personnel carriers. Payload of 7 tonnes, which would include ATGMs, smart munitions, cluster bombs etc. Capable of low level sub sonic flight. Northrop and Fairchild Republic (the later was the designer of the P-47 Thunderbolt) were selected to build their designs and pit them against each other as part of the competition. Northrop built the YA-9 whereas Fairchild Republic named theirs as YA-10. These aircraft were pitted against each other in fly offs, interestingly the YA-10 didnt fare well during them. USAF selected it even though it didnt satisfy some of the performance parameters as it ended up being more survivable than its competitor. Its engines mounted aft of the wings reduced chances of FOD and damage by ground fire, larger space between pylons allowed wider range of weapons to be employed, it was more maintainable, extensive shielding and separation of critical components made it more survivable. With the YA-10 being very similar to the production variant offered, it emerged as a more suitable option. YA-10 was officially selected in Jan 1973 and full scale production began in 1975. A total of 713 jets were procured over the years and as per official plans, they are supposed to be replaced by the F-35. In the year 1969, the Soviet ministry of defense started to look for an aircraft they called “Shturmovik” which roughly translates into stormer or attacker. Soviets felt the need for such an aircraft after studying the performance of the legendary Il-2 and its successor Il-10. After the production of the latter was stopped in 1950, there were no close air support aircraft under development. The Ilyushin bureau made an attempt in vain with the Il-40 during the early 1950s to find a successor for the Il-10. After nearly one and a half decade, the Soviet defense ministry put up requirements for such an aircraft. They are as follows. Easy to produce and fly. Max payload of 3 tonnes. Weapons payload should include bombs, unguided rockets, and AAMs for self defense. The point easy to produce was interpreted as an aircraft based on an existing design. Thus Sukhoi initially offered the Su-15Sh a variant of the Su-15 supersonic interceptor, Mikoyan offered MiG-21Sh, Yakolev offered Yak-Lsh and the Ilyushin bureau offered a variant of the Il-40, designated Il-42. The designation was later changed to Il-102. The designs were submitted within 4 months of the original request. The interceptor based ones were rejected as they didnt have the performance which this new aircraft was supposed to have. Sukhoi now offered a previously unofficial design instead of the Su-15Sh. This design was given the designation T-8 for internal use in the bureau. It would have a conventional planoform of shoulder mounted wings, engines below them and a regular tail. It turned out that this T-8 design would be the only one to satisfy the operational requirements. Sukhoi and Mikoyan were given the preference to start the work on their designs, however Mikoyan backed out. Sukhoi was devel0ping its T-8 whereas Ilyushin was working on Il-102. The later ended up being a private venture for the designer. The work was going on smoothly until the Soviets dropped a bomb by increasing required speed to 1200kph, thus Sukhoi bureau decided to kill the T-8 and restart work on the Su-15 derivative. However this specs were soon changed to 1000kph at sea level but increased payload of 4 tonnes. The T-8 design was then revived and modified for the changed requirements. The final design process was started in 1972 with the prototypes appearing in 1974, making the first flight for the type on 22nd Feb 1975. There were delays due to the design of the engine which caused a minor fire and delayed the first flight. The prototypes were tested thoroughly during the late 1970s, with one of them being “executed”, in other words used for extensive ballistics tests. These tests were followed by Operation Rhomb, which was started in May 1980 to test both the Su-25 and the Yak-42 in Afghanistan. The aim was to test both of the aircraft in real world scenarios, including live combat operations. The first and third Su-25 prototypes were sent to the theater and they successfully engaged live targets during the conflict. The prototypes logged over 100 sorties including 44 live combat sorties during the deployment. Their success forced the Soviets to fast track the development and testing of Su-25. The state acceptance trials were held in the later half of 1980 and the aircraft was expected into service thereafter. Since the YA-10 was supposed to use the M61 Vulcam 20mm Gatling gun instead of the GAU-8 which was under development at that time, several modifications were made to the production variant to fit the massive 30mm Gatling gun into it. The gun itself is slightly to the left and the nose gear is slightly to the right. Behind the pilot a drum carrying more than 1300 rounds is placed. The aircraft is literally designed around the gun, which is nearly 6m long including the ammo drum. The gun can unleash 4200 round per minute onto the target giving the pilot 15 seconds worth of firing time. It usually carries armored piercing rounds which decimates thin top armor on APCs and tanks to kill them. A-10 also has 11 hardpoints and a 7 tonne payload for a wide variety of munitions. The A-10C upgrade brings new targeting pod and several other advanced avionics to improve its tank killing capability. A-10 pilots have claimed that when the GAU-8 is fired, the vibrations caused by it are similar to those felt by world war 2 era pilots while firing their guns. Other weapons carried include the new Paveway series of bombs, JDAMs, AGM-65 for striking surface targets and AIM-9 for self defense. A-10 armed to the teeth. The aircraft is powered by 2 TF-34 turbofans producing a total of 18,000 pounds of thrust. Add moderate wing loading and straight wings to the jet and you have good low level maneuverability. An F-14 pilot was shocked to see its maneuvering capability as he was positioning his jet for a simulated kill. The A-10 eventually turned tides and lined up its GAU-8 for a simulated gun kill. The aircraft is literally a flying tank, the pilot literally sits in a titanium bath tub which provides extensive protection for anti aircraft fire of upto 23mm. The position of the engines makes them a difficult target to hit. The flight control system has double hydraulic back up along with a mechanical backup for the hydraulic system. The fuel tanks are self sealing and have polyurethane lining to reduce loss of fuel and damage to the tanks themselves. The primary fuel tanks also have a back up sump tank with enough fuel for over 200km. The landing gears are exposed so that the aircraft can land with them retracted if needed. The A-10 is surely a very very very tough target to kill. The A-10, more commonly known as the Warthog and will be replaced by the 5th gen F-35 in the near future. USAF was planning to cull the entire A-10 and transfer the resources used to keep them operational to other projects. It has also been blamed for the delays in the F-35 programme as the USAF claims that the resources being used to keep them operational could speed up the F-35 programme. US Senate blocked the plan to cull the A-10 fleet and it was redeployed to the middle east as another conflict erupted. It has also been redeployed to Europe, the theater it was designed to operate in, the theater where it was supposed to stop Soviet armored formations dead in their tracks. They were redeployed to show support the NATO allies against rising tensions due to conflict in the eastern Europe. Compared to the F-35, A-10 is very cheap to operate and easy to maintain. It is combat proven and the troops love it. When they are under fire, the characteristic sound of its gun is the best thing they have ever heard. Several serving members of the US armed forces have shown support for the A-10, but it an old aircraft which is nearing the end of its useful. With the F-35 ready to replace it, it will be interesting to see the approach USAF uses to provide close air support. It will most probably involve deploying JDAMs from high altitudes. Just like the A-10, Su-25 was also designed to be a flying tank. The cockpit was covered from all directions and could withstand direct hits from 23mm anti aircraft fire. The pilot is also protected by an armored helmet and an armor plate near the chest. The engines are widely spaced thus reducing the probability of both being simultaneously hit and disabled. Engine controls are duplicated and the fuel is fed by different tanks. The tanks are protected by armor, engines and parts of the retracted landing gear. Polyurethane lining reduces loss of fuel and damage due to shrapnel. Flight controlled system has duplicated push/pull rods and the elevators have separate control systems. The engine itself can withstand hits from 20mm rounds and work just fine, they have even reportedly survived Stinger hits. The engines were run using different fuels like diesel during the trials and can use various fuels if necessary. Su-25 is lightly armored compared to the A-10 but this is justified by the different approaches taken by the designers. Su-25 was supposed to be agile and thus a difficult target to hit instead of being heavy and durable like the A-10. Initially the prototypes were powered by R9-300 engines, a non afterburing variant of the RD-9 used on MiG-19. The prototypes were re-engined with non after burning variants of the R13 engines used on the MiG-21. The engines were designated R95 and were replaced by an improved variant R195 during tests. Wings were designed to carry most of the armament with 8 hardpoints for anti surface weapons and 2 hardpoints for self defense weapons. A single fuselage hardpoint can be used for carrying weapons, sensors, jammers etc. It can carry advanced air to surface weapons like Kh-29 and Kh-31 and modern AAMs like R-73 for self defense. Interestingly it could also carry tactical nukes. Su-25 could maneuver pretty well and pull a maximum of 6.5Gs, add a 30mm dual barrel Gsh 30-2 30mm gun and this humble close air support aircraft could easily turn tides against an attacker. Su-25 prototypes demonstrated their capability of carrying 4 tonnes of payload during the Afghan campaign while operating from high altitude bases. Production Su-25 would see extensive use in the theater. 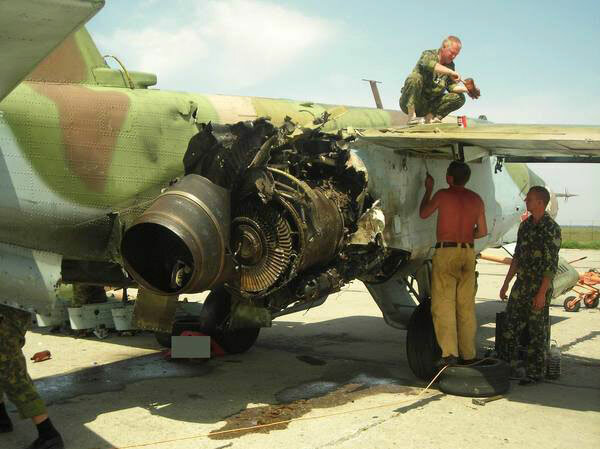 Shows the damage Su-25 managed to return with. Unlike the USAF, Russian airforce is no way abandoning one of their most capable aircraft. 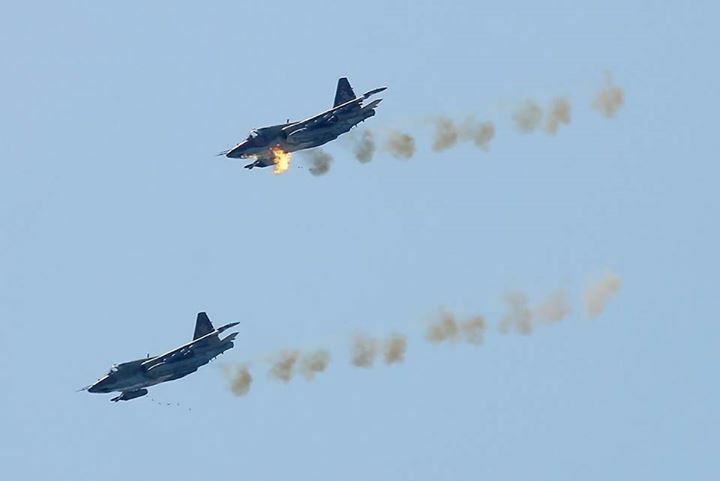 Several of the mothballed Su-25s are being upgraded to new standards with new weapons, targeting systems, self defense suites, uprated engines etc. Su-25 is also used as a carrier trainer by the Russian navy, to train its budding pilots. Su-25 like the A-10 is also combat proven, but it has operated in tougher conditions. They faced Stinger MANPADS and anti aircraft fire during the Soviet Afghan campaign and performed well during the conflict. Su-25 would surely serve the Russians and its foreign operators for years to come. If there is one thing the Su-25 can do but the A-10 can’t, is to operate from a carrier. Here is a Su-25UTG taking off from Admiral Kuznetsov. Great article! I like how you mention that the two aircraft can’t be properly compared, because in regards to their missions, they have two different roles. SU 25 on a carrier? Seems great but the picture shown is deceptive. How about showing a video of a take off with full armaments. Full armaments. Full armaments on take off. If you want a good laugh, watch some youtube videos of Pierre Sprey slamming the new F-35. He says there is no way it can replace the A-10’s ground-support performance due to weak armament, crap maneuverability, insufficient loiter time, ridiculously high cost per unit, time-consuming and overly-complex maintenance requirements by ground crews, and unacceptable vulnerability to AA fire. Previous Previous post: Armata: The armored vehicle of the future.